We don’t talk about math much around here, so if you are looking for fun, effective, easy to use resources to help kids master math, you’re going to want to check out the adorable Kiki’s Classroom. First, learn a little about how this Teachers Pay Teachers author solved an all too common classroom problem. Her solution, by the way, also had the happy consequence of helping her struggling students. Flashback: January, 1996. I was a first year teacher facing the looming, state-required, standardized test (known simply as “The Test” to the veterans on my third grade team). Stories were told, eyes were rolled, hands were wrung, and mountains of math review packets were copied, stapled, and delivered with a thud to my already crowded desk. Use these, I was told. This is what we do, I was told. And so, dutifully, throughout the months of January and February, my students and I worked our way through those review packets. We practiced, corrected, discussed, and reviewed. And then we reviewed some more. Lather, rinse, repeat, for the six or eight weeks that preceded the dreaded Test. Three times each week, part of our instructional time was given over to test prep. That’s right: instructional time. By the end of February, we had lost countless hours to test prep, and I knew I had to change something. That spring, I made a promise to myself and to my future students that we wouldn’t suffer through two months of intense review again. I knew there had to be a better way—a way that honored all that I knew about teaching, and that brought about authentic learning. I wanted long-term retention and true mastery of third grade skills and concepts. It happened to be the year that my school district was considering adoption of a new and somewhat controversial math program, one that introduced the notion of “spiral curriculum” to many veteran teachers, who were quite comfortable teaching math the way they always had, thank you very much. 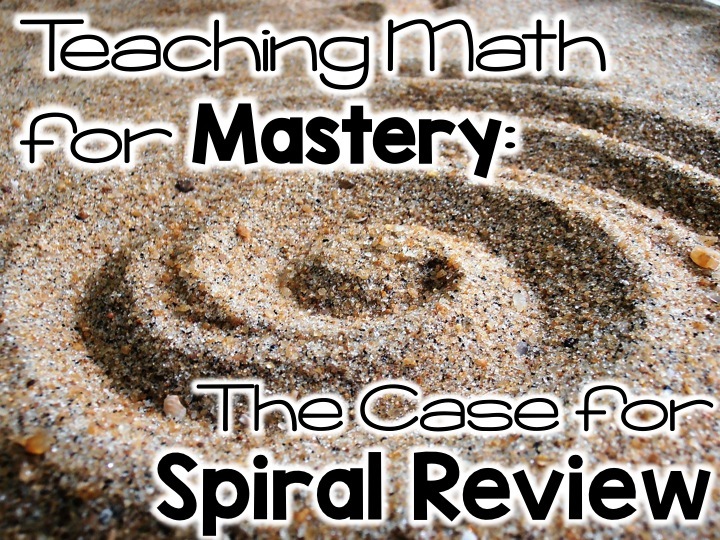 Though “spiral review” was a new term to many teachers, it was hard to argue with the logic of daily work that reinforced and supported our regular practice over the course of the year. Not coincidentally, that summer, my daily math review was born. It’s taken on many forms and formats through the years, but the foundation has always remained the same: every day, my students and I would spend the first ten to fifteen minutes of the day going over previously taught third grade math skills and concepts. It served as my “morning work,” a way to focus kids’ attention when they entered the classroom each morning while I took care of routine tasks like attendance and collecting notes from home. But the magic…well, the magic happened when we came together as a class to go over students’ work. I’d project a page on the pull-down screen (this was 1996, after all…I used my overhead projector all day long!) and student volunteers would come to the overhead and “be the teacher” for one of the five problems presented that morning. Suddenly, I had gained instructional time, because in the few minutes it took us each day to go over their work, we could share our thinking, discuss our strategies, and identify concepts that needed further review. It was the perfect opportunity to model, teach, reteach, and preview concepts in a quick, daily dose. Areas that needed reteaching were identified early, and I could implement interventions for my struggling learners when those skills and concepts arose again. It was efficient, and it was effective. Fast forward: January, 1997. The (same) math review packets arrived once again, landing expectantly on my desk. Thud. Faced with a choice but confident in my kids, I chose to stash the packets away in a cabinet, and elected not to use them at all. We carried on, and faced The Test with confidence. We not only survived but we thrived. My kids’ performance confirmed what I knew—and all of us know—that the best, most authentic “test prep” comes from authentic teaching and authentic learning. That doesn’t happen when we cram it all in two months before the test. It happens when we prepare our kids all year long, with seamless “test prep” that isn’t test prep at all…it’s just a part of our daily teaching. Krista creates standards-based resources for the elementary classroom, with an emphasis on grades 2 through 4. You can find her thoughtfully designed resources, including her Morning Math packs, in Kiki’s Classroom on Teachers Pay Teachers.